Saul Alinsky, according to Time Magazine in 1970, was a "prophet of power to the people," someone who "has possibly antagonized more people . . . than any other living American." 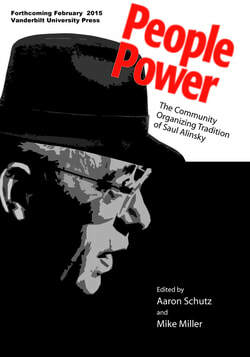 People Power introduces the major organizers who adopted and modified Alinsky's vision across the United States. Weaving classic texts with interviews and their own context-setting commentaries, the editors of People Power provide the first comprehensive history of Alinsky-based organizing in the tumultuous period from 1955 to 1980, when the key organizing groups in the United States took form. Many of these selections--previously available only on untranscribed audiotapes or in difficult-to-read mimeograph or Xerox formats--appear in print here for the first time. This book introduces the vibrant, conflictual, and yet deeply relational world of community organizing. Community organizers build solidarity and collective power in fractured communities. They help ordinary people turn their private pain into public action, releasing hidden capacities for leadership and strategy. Organizing groups thrive amid what Saul Alinsky called “hard reality”: the “sweeping passions” “conflict, confusion, seeming chaos” and “drama” of the public realm. This book will transform your understanding of civic action and social change in America. Middle-class progressives in the early 20th Century wanted to transform a corrupt and chaotic industrial America into an "authentic" democracy. But they were led astray by their privilege. Focused on enhancing the voices of individuals, generations of progressives remained blind to the rich culture of "democratic solidarity" infusing labor unions and organizing in poor communities. This book traces the problematic evolution of progressive democracy in America, focusing on schools as a key site of progressive practice. At the same time, it examines alternative strategies for developing more empowering approaches to democratic education and collective action. In this series at OpenLeft.com I have been critically examining different aspects of community organizing. Older posts in the series originally posted on Education Policy Blog are available here. In my published scholarship, I seek to be as accurate and comprehensive as possible. I see blogging as a very different animal. My posts are really "think pieces," meant to provoke thinking and frame out possibilities, often written very quickly. When I cite research, I do it selectively, often from examples I happen to know about. The option for people to respond means that if I make obvious mistakes, there is an opportunity for the community to correct them (to the extent that anyone is reading my posts in the first place). Please note that I have frequently edited and will continue to develop blog posts without necessarily indicating I have done this. See also "Why I Blog." Comment on these papers or this website here.